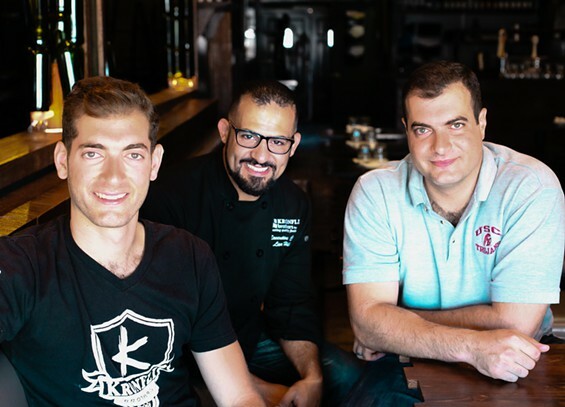 Robert Kronfli with chef Lior Hillel (center) and his brother Danny. What started during 27-year-old Robert Kronfli’s sophomore year at USC as a weekly dinner party for friends in an off-campus apartment has blossomed into a mini-hospitality empire: the small plates hotspot Bacaro L.A. near the USC campus, Nature’s Brew café and coffeehouse located two doors down, Kronfli Brothers line of sauces and now Bacari PDR, which opened last month on the hill overlooking the ocean in the Playa del Rey spot where the bright yellow Bistro Du Soleil once stood. Kronfli, who was named in the Zagat “30 Under 30” list just last month, owns all of these ventures with his older brother Daniel, who’s also a USC alum. Entrepreneurship is in their blood. Growing up, their Lebanese father ran a business with his brother. In fact, everyone on their father’s side of the family — up to Kronfli’s great, great, grandfather — owned their own business, and many of them worked closely with one or more of their brothers.